Pantang is Awesome | escaped. For the first week of pantang, I had a confinement lady over to do my tungku and urut session, and also to take care of Rayyan - getting him bathed, massaged and putting him to sleep. Mum was here for the whole first week so she cooked pantang food for me while giving me the Babies 101 lesson. I smell of sweet herbal massage oil 24/7 and I have come to know the existence of the words tapel, param, pilis and tangas. For the second week, I was home in Penang, if you've read my sappy updates. It was supposed to be for 2 weeks, but I managed to waggle my way out and pack my bag to go back to KL as soon as Mum gave the green light. Learned how to bath Rayyan, which is the most important thing in Mum's Babies 101 lesson. For the third week, my MIL was over at our house to take care of Rayyan and I. And it was funny that it turned out my MIL was way cooler than Mum (in terms of pantang, at least) haha! She gladly took Rayyan out of our hands whenever she can so we could have longer sleep at night. Longer here means 2-hour straight of sleep, to be honest, because after 2 hours Rayyan would be in my arms again to be fed. And this week, I have a (different) confinement lady over to resume my tungku and urut session, to take care of Rayyan and also to cook my pantang food. Hence the picture above. 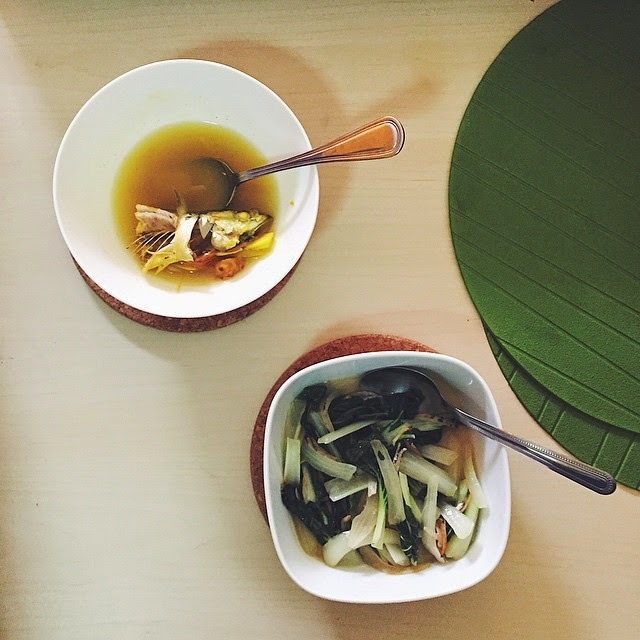 It's her menu for me today; ikan singgang and sup sayur yay.